The new MINI-VERTICUS & VERTICUS Series set the standards of the future for stationary high-pressure compressor systems. They combine the legendary BAUER compressor blocks with improved components and ultra-modern design! During the redesign, the focus was on ergonomics, making operation as easy as possible, reducing noise and boosting efficiency. 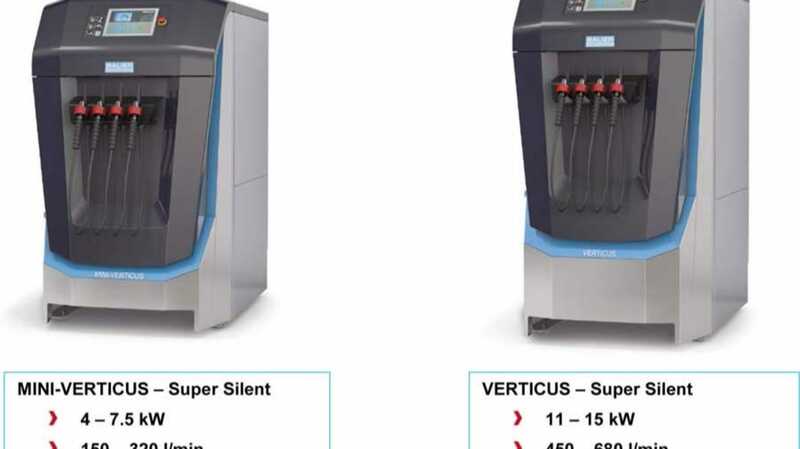 VERTICUS is suitable for the power range from 11 to 15 kW. MINI-VERTICUS is more compact and is available for motor powers up to 7.5 kW. The new, extremely compact MINI-VERTICUS benefits particularly from BAUER’s signature design, which enabled the maximum delivery volume of its top- end model to be increased by over 20 per cent to 320 l/min. SMARTPHONE INTERACTION: The newly developed B-APP works with B-CONTROL MICRO to transform your smartphone into a high-performance compressor remote control unit. CONTINUOUS AIR MONITORING: B-DETECTION PLUS i is the new fully integrated gas measurement system that monitors the quality of the breathing air produced by the system. Automatic, continuous and outstandingly reliable. ICONIC DESIGN: The groundbreaking design sets new standards. All the main operating elements and displays are conveniently located on the front for maximum ease of access and viewing. The front panel can be opened with a single movement to change the filter rapidly and conveniently. CONVENIENCE AND SAFETY: The filling levers feature a new easy-grip ergonomic design that also effectively prevents pressurised filling hoses from being opened by mistake when unconnected to gas cylinders. EVEN QUIETER: The sophisticated soundproofing concept has reduced the already low noise level still further. The motor is suspended in an optimised anti-vibration frame and incorporates a new type of high-efficiency hydro-damping system. The new MINI-VERTICUS and VERTICUS compressor systems can be ordered from 30 January 2017.